I’m not a cheerleader for the vj concept. I do like being one and I think it’s a great idea in many broadcast situations. Probably not all the time and for every reporter and photographer, but for me and for today…it was good. I was covering the installation of the new Bishop for the Nashville Diocese. I had live shots in the 4 and 6 o’clock newscasts. I was finishing up my profanity series piece for tonight before heading to the cathedral for the 3 o’clock start. My plan was to get a couple of soundbytes from people attending the ceremony to talk about the importance of the day. The sanctuary was crowded and since the Diocese was providing stations with a live feed from inside, we weren’t invited inside. Armed with my new friend, the Sony HD camera, I managed to get permission to go inside the vestibule of the cathedral to interview some of the deacons and priests who would be part of the service. After getting about five interviews, I was about to head to the satellite truck when I saw the Bishop. He was making his way through the crowd, shaking hands and thanking people for their prayers and support. I made a point to meet with the Bishop my first week here so when we saw each other, there was some recognition. He walked over, said hello and I asked if I could ask him a couple of questions. This was only about 5 minutes before the start of the service. Now Bishop David Choby is a very warm and friendly man and I know he would gladly talk to any reporter who wanted to pose a few questions. In other words, I didn’t get the interview because I had met him before or because he liked me; I got the interview because I was fortunate enough to be working as a vj. Seriously, I don’t know that a two-man crew would have been given access to the lobby. It was very crowded and two more people (especially one with a video camera on their shoulder) would have been too much. It would have been very easy for them to say “no…”. But a vj? Isn’t that like just one more person in the room? I’ve said it before and I’ll post it again here. Being a video journalist really suits me. I don’t mind shooting my own standups and my own video and writing and editing my own stories. I understand when reporters and photographers post complaints and criticize the concept on message boards. It’s not a good fit for everyone. But it is for me, and today…I wouldn’t have traded it. The generation that grew up with only a “Three’s Company” Mr. Furley image of Don Knotts in their minds will likely never know what a terrific actor Don Knotts was. But he was great. Don Knotts, who passed away this weekend, was a comic genius. Were it not for Knotts, most of us would never have seen “The Andy Griffith Show” because it wouldn’t have been a hit and no way would it still be on the air 46 years after it debuted. Sure, you could say he played the same character in every film and tv show he played. But what a character it was. 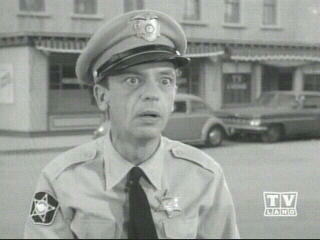 In my opinion, Barney Fife is the single best character to ever hit the small screen. He not only starred in the show, he stole it. Week after week. Seeing him getting drunk on moonshine or putting the moves on Thelma Lou, or his phone calls to Juanita at the diner are some of the funniest moments ever put on television. Don Knotts not only made me laugh in Mayberry and Mt. Pilot, but also in “The Shakiest Gun in the West”, “The Ghost and Mr. Chicken”, “The Incredible Mr. Limpet” and the now impossible to find on video “The Private Eyes”. I asked a Huntsville Times photographer to snap a photo of me with him but I never saw it or got a copy. I wish I had. I love what the copy editor at the Miami Herald wrote to title the article today on the passing of Don Knotts: “His lone bullet never failed to hit funny bone”. I bet he’d think that was funny too. Oh Crap, was that for the Stern Show? Boy this new technology makes things move fast. Late in the day yesterday I proposed that I say the “s word” in a standup for a story on profanity. I proposed that we bleep it out. My GM blogged about the question early last night and asked for comments and response. Early this morning, a buddy told me that the question had made it to the headlines on NewsBlues. It seems that the FCC plans to issue a ruling that the ‘s word’ is indecent and will fine stations and networks that air it. Mike had about 18 comments on his blog late in the morning. By lunchtime, Sirrius Satellite radio was on the phone. Sirrius is the home of Howard Stern now. I hesitated to talk to the reporter but then figured I could at least tell him the nature of my story and basically repeat what had already been blogged by me and Mike. The reporter, Mike Piazza, wanted to know if I felt that the FCC ruling would hurt my story. “Do you feel hamstrung by the FCC ruling on the S-word?” he asked. I told him no, since I never really wanted to air the word but preferred to bleep it out. Now I don’t know if or how the interview will be used by Sirrius. Because of the nature of Stern’s programs and his fight with the FCC over indecency and obscenities, I wouldn’t be surprised if they use it on the show. I don’t know that they were happy that I didn’t criticize the FCC and think if I did say that my story on profanity would be lessened or harmed by being placed in verbal handcuffs that it would have added to their case. But if they do use it on Stern’s show it will be the second time I’ve made the Howard Stern Show. The first was a few years ago when I interviewed Mike Tyson in a press conference before a fight and I mistakenly thought the champ’s months old baby in his lap was a girl. “What’s your little girl’s name?” I asked. “What?” “What’s your little girl’s name?”. “This ain’t no girl.” Mike sharply replied. “This is Mike’s boy”. Well that question and his response was played on ESPN about 100 times in the next few days and I hear Howard got a big kick out of it and may have even taken a swipe at the idiot reporter who asked the question. I don’t believe I said anything today that was the least bit provocative (or stupid) but with Stern, there’s no telling what he might pull out of it. I probably should have told them “no comment” but I hate it when someone says that to me. I only repeated what I’d already blogged, but still I’m having second thoughts about even answering the phone. I don’t have Sirrius and I’ve already posted what I think about Stern’s shtick. But if you hear anything let me know. I’m working on a piece for Sunday night on profanity. It’s a fascinating subject and the interviews have been more interesting than I imagined. I’m looking at profanity in regards to how we’ve gotten to this point where profane words are used so often that they’ve almost lost their power. The story will examine where the words come from. What the Bible says about using them and the effect they have on the people who say them and on the people they are directed toward. I’ve interviewed a college football coach, a military chaplain, a theologian, a minister and about a dozen teenagers and some of their parents. I’m using clips from movies and tv shows and will look back on the first time a curse word made an appearance on network television. Now, I want to tell a story of a minister or evangelist who once told a congregation a story and, for effect and to make a point, used a curse word. I want to tell that story as I think it would be effective in demonstrating how people of faith feel about those words. But the only way to really use the story is for me to tell the story in a standup. So today I talked with my news director and general manager to see how they would feel about me using it. The religion reporter, using a profane word (not one of the big bad words but one we hear in movies and on the street quite often). I don’t know that a reporter for a local news station has ever intentionally used a profanity like this on the air. I don’t know that a reporter has ever intentionally used a profanity like this and even bleeped it out. My news director and gm are neutral on this so far. My gm posted about it on his blog and asked for suggestions. I’m doing the same here. So does anyone know if S**T has ever intentionally been used on a local newscast? If so, how was it used and what was the response? And I know some of you will have the knee-jerk reaction that this is just a stunt for sweeps. That’s not me and that’s not the point. I’m doing a story on profanity and if this story from the evangelist wasn’t a powerful way of demonstrating how people of faith think regarding profane words, I wouldn’t use it. So let me know what you think and I’ll let you know what we decide. Then, I’ll pass along the story. Roger Simmons, who has a website/blog which covers Orlando, FL tv, posted a link earlier today to two myspace websites. Sorry, this Mac laptop software doesn’t allow for adding links, so you’ll have to copy this and paste it in your browser. Frankly, I think this is a couple of sweeps stories. Also, Lost Remote is reporting that KUSA, the NBC affil in Denver has hired it’s first vj. This is big since KUSA is one of the top photography shops in the country. Meanwhile, there’s lots of debate about vjs on www.b-roll.net in the message board area. A couple of former WKRN VJs who didn’t like the new system have posted some pretty negative opinions. Now I don’t expect every videographer to like the vj model. I expect most of them to hate it. I also expect a lot of reporters to hate it. It’s a big change and it’s more work. But I’ll also say it again, it suites me fine. I’m a little surprised that I like it as much as I do. Granted, I’m covering a beat (religion and ethics) which is more suited for vj work. I understand how run-and-gun, 5-6 packages a week plus liveshots and vo/sots could be nearly impossible for vjs. But I believe the primary goal behind this idea is to improve the content and story count in newscasts. That’s what viewers have been complaining about for years. My mom and dad used to watch the news 3 times each day. Last time I was home mom told me “we’ll watch the 5 or 6 but after that…you just see the same stuff over and over again”. How often do you see a reporter cover the same story for the 4, 4:30, 5 and 6? I know I’ve done my share of repeated broadcasts. Change it from a package to a vo/sot and put it in another part of the newscast. I believe new stories make newcasts better. I believe beats make the newscasts better. You can’t do either in a traditional two-person crew newsroom. Yup, being a vj is harder. You’ve got twice the work to do. You can’t talk it up with a person while the videographer gets the shots. You can’t work on the lead-in and tag while the story’s being edited. But for me personally, it’s the only way I’d want to be back in the tv news business. When I loaded up the truck this morning for the trip back to Nashville, I was surprised to find ice INSIDE the truck. It was early and I was already running late. When I put the milk crate holding batteries, chargers, cds, hand sanitizer, makeup powder and everything else I might need on a day of reporting, I found brown ice all over the seats, the floorboard, the windows and the dash. “What the?” It was odd. First time I think I’ve seen brown ice on the inside of a vehicle. I stared at it for awhile, trying to figure out where it came from. And then I remembered. Friday on my return trip to Memphis, I found a deal on a 4 pack of Diet Dr. Pepper. I had one on the way home but left the others in the floorboard. So sometime this morning, when the temperature crawled down into the teens, one of those cans of DDP commenced to exploding. I found the can, shredded from the release of pressure in the front floorboard. The top part of the can, bent but otherwise intact, was found in the back. That must have been something to see. Thank goodness it was still below freezing so the cleanup was simple and quick with the Shop Vac. I carefully removed the remaining two frozen cans and was on my way. And by the way, as I type this I realize how I miss Peggy’s website. Surely I’m not the only one. It’s going to be a long drive back to Nashville. I debated whether to try my luck tonight or tomorrow morning. Thanks to the WKRN weather blog, I was able to hear from folks who’ve been driving around town today and tonight. Nashville is still getting sleet and snow so I decided to make the drive tomorrow morning. My story is already set up with a first interview at 9:30. I should be able to make it fine. But this commute is wearing thin. We scheduled an open house for today but didn’t expect anyone to be house-shopping in the bad weather. A couple of families did come by and seemed to like the house. We’re praying the right folks come along soon. I may try the faith approach at selling the house. Legend has it if you bury a St. Joseph statue in your front yard, he will lead a buyer to your home. We tried it years ago when we moved from Huntsville and within a couple of weeks, we had an offer. I’ve heard one story of a man who lived near the city dump. After burying the statue, he became frustrated at not attracting a buyer. In anger he dug up the statue and threw it in the backyard. Two or three days later the newspaper headline read “City Dump Sold”. You can now buy a St. Joseph Home Sale Kit online. I’m not Catholic but I’m willing to try it.